Shops aren’t just places to buy things: in many cases, they’re community hubs. And as such, they should be safe spaces for customers and workers. 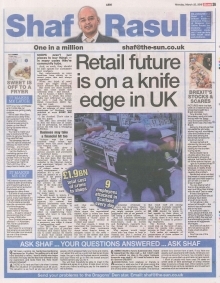 But unfortunately, as news headlines have shown us in recent years, safety in shops isn’t always guaranteed. When you think of retail crime you might think of minor offences like shoplifting, but there are other horrible crimes that come under that umbrella term, like assault. I’ll be honest, I didn’t realise the extent to which retail crime had infiltrated our society until I read Scottish Retail Consortium (SRC) figures last week. The organisation revealed an average of nine retail employees in Scotland were attacked at work EVERY DAY last year. I am shocked. That’s nine a day too many. The British Retail Consortium (BRC) revealed that in 2017, the total cost of crime, and crime prevention, for retailers across the UK was £1.9bn - £900m directly from retail crime and £1bn spent in crime prevention. Violence was the most common retail crime, and knives were most significant weapon used. The SRC also drew a correlation between the most serious assaults and purchases of restricted items. There are so many elements in the mix here but the most important thing we have to consider is the physical, mental and emotional impact on the people involved. A violent crime in a retail environment – whether it’s a robbery, an assault or a breach of the peace – can have a significant impact on the person at the helm of the shop and all of the staff involved. It can leave its mark for many years. And to add insult to injury, it follows that the business may take a financial hit too. Because it’s natural that businesses affected may want to install additional security measures to deter prospective criminals. This can also have a ripple effect on neighbouring businesses who want to take precautions too. For many small businesses this can mean a big outlay, but a necessary one when it comes to safeguarding staff. The BRC also stated that almost 80 per cent of retailers surveyed said they’d fallen victim to cyber attacks, so there’s no doubt that cyber security measures will be upped too. We also have to think about the reputational aspect. After a crime has been committed, will people consider a business a ‘scary’ place to go, leading to a decline in footfall and sales? For that reason, I think it’s important for businesses to be clear with their customers about what they’re doing to mitigate crime in the area – but not to the extent that they (a) create fear, or (b) allow potential criminals to spot any loopholes. There are some lines of work where you might assume you’re at heightened risk of an assault – like being a police officer for example. And it’s pretty common knowledge that many emergency services front-liners, like nurses and firefighters, regularly face the threat of violence on a daily basis. Though why anyone would actively target those who are there to help is beyond me. But I reckon it’s probably a lesser known fact that retail staff are amongst those being routinely targeted. Whatever industry you’re in, NOBODY should ever be made to feel unsafe in their place of work. It’s totally unacceptable. Clearly there is still work be done when it comes to protecting employees. The Scottish legal system could step up the level of penalties for people who assault anyone in their place of work. Let’s make an example of the perpetrators to deter more criminals from acting. Pictures went viral last week of a massive haul of shopping bought by a Brexit stockpiler. Tony Smollet from Worcester went OTT with his Tesco shop and spent £660 in case there was a no deal Brexit. Going by the picture that circulated far and wide, bog roll, cornflakes, cider and bottles of red wine were amongst the items he feared he’d run out of. He was named and shamed by his own wife who gave him a ribbing for his drunken buying spree. Many people had a chuckle about the over enthusiastic shopping splurge, but there’s a not-so-funny side to this too. I get so frustrated when I read about stockpiling because in reality, those who fear running out are causing the problem. Remember when we had that week of crazy snowfall last year and there wasn’t a pint of milk or a loaf of bread in sight? You can blame half of that on the people that went out filling their trollies with the stuff “just in case”. If they’d bought the usual amount there’d probably have been enough to go round. I’m not alone in this school of thought – the nation’s top economists are on my side. As everyone waits in limbo ahead of Brexit, the Office for Budget Responsibility (OBR) has warned that stockpiling goods in advance will aggravate shortages. So a word of caution – let’s not panic and make a bad situation worse – don’t be one of the hoarders! The internet recently celebrated its 30th anniversary and it has brought about an e-commerce revolution that’s been a game changer for many firms. But while it has provided a new revenue stream for some, many businesses on the high street are being hit in the pockets as people take the convenient option of online shopping. I was sad to see the latest victim is Thomas Cook – it’s set to close 21 stores across the UK with the loss of 300 jobs. Four Scottish stores are affected…Aberdeen, Fife, North Lanarkshire and Glasgow. Online travel agents, low cost airlines and political unrest in some holiday destinations has been blamed. Sad news for a company that sprang up way back in 1841 and was once revered as one of the ultimate travel providers. Not long now until Easter and it looks like our chippies are getting creative. We’ve seen Mars Bars battered and deep fried so I suppose it was only a matter of time before someone dreamed up the idea of doing the same with a Cream Egg. You have to make your way to Airdrie’s Off the Hook to get your hands on this calorific treat. The takeaway has created the special seasonal delicacy to mark its fifth birthday…one I’m sure will be remembered. I bet the Cadbury’s marketing genius who dreamed up the catchphrase “How Do You Eat Yours?” never imagined the response might be: “Och ahl huv mine deep fried in batter hen”.